Scotland’s leading anti-sectarian charity has taken its campaign to Central Scotland. Nil by Mouth recently ran a full day of workshops for the whole S3 yeargroup at St Modan’s High School in Stirling. Through a mixture of presentations, workshops and activities pupils were encouraged to discuss and reflect on the issue of sectarian hatred in Scotland. The sessions challenged pupils to examine the roots of sectarian attitudes and the potential harm caused by stereotyping individuals. They also discussed songs, words and phrases associated with bigotry. Special attention was given to the rising use of social media to spread bigotry and hate. Pupils explored the consequences of using sectarian language on sites such as facebook and twitter. The day was part of Nil by Mouth’s ‘Champion for Change’ programme which seeks to promote best practice and greater awareness of sectarianism in our schools. Later this year the charity will also work in both Wallace and Stirling High Schools in the area. It’s part of a widley growing education programme which has seen over 10,000 pupils work with the charity in recent years. 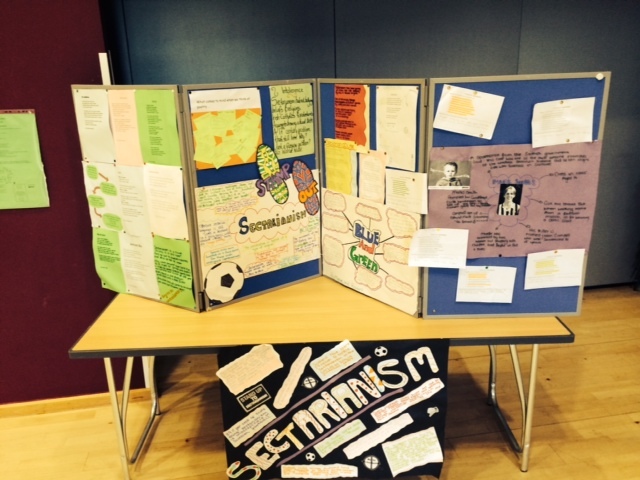 “The level of engagement from the S3’s at St Modan’s was fantastic and there was a lot of good discussion. It is important that these pupils are given the opportunity to express their attitudes towards sectarianism as well as learning more about it.